NCStar CVCP2960D36 2960 Rifle Case PVC Tactical Nylon Smooth 36x13 in. Digital Camouflage in. 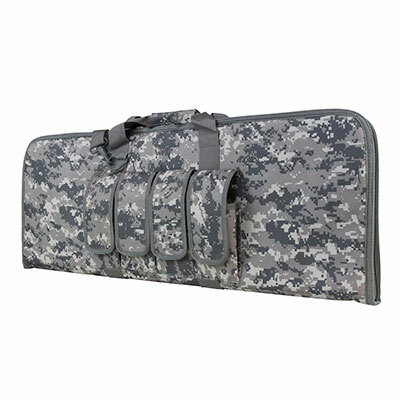 2960 series Carbine Gun Case is designed for carbines that are less than 36 in overall length. This gun case has many popular features like heavy duty zippers that are lockable four external magazine pouches padded carry handle and adjustable shoulder straps. This is a great case for protecting and transporting carbines to the range. It features four external rifle magazine pouches with individual magazine flaps with hook and loop fasteners heavy duty zippers that can be locked with a small pad lock and padded carry handle straps and a shoulder sling is included."